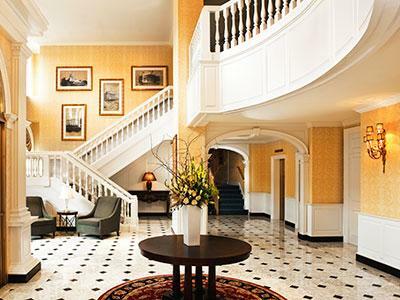 WASHINGTON, DC—Historic Hotels of America inducted 22 hotels into membership in 2015. Hotels nominated and accepted into the program in 2015 range in age from 125 years to 52 years old, and represent 16 states and the District of Columbia. The oldest historic hotel dates to 1890. Nine of the hotels were adapted from a previous use, including a chocolate factory, army barracks, silversmith and jewelry studio. Of the historic hotels inducted last year, eight are listed in the National Register of Historic Places and one has been designated by the U.S. Secretary of the Interior as a National Historic Landmark. Hotels inducted into Historic Hotels of America members during 2015 include Fairmont Heritage Place, Ghirardelli Square (1890), San Francisco; Inn at Diamond Cove (1890), Portland, ME; The Partridge Inn, Curio, A Collection by Hilton (1892), Augusta, GA; Sheridan Inn (1893), Sheridan, WY; Southernmost House (1896), Key West, FL; The Silversmith Hotel Chicago Downtown (1897); Inn at Wise (1910), Wise, Va; Embassy Suites by Hilton Portland Downtown (1912), Portland, OR; Keswick Hall and Golf Club (1912), Charlottesville, VA; Bear Mountain Inn (1915), Bear Mountain, NY; Claremont Club & Spa, A Fairmont Hotel (1915), Berkeley, CA; LondonHouse Chicago, Curio, A Collection by Hilton (1923); The Sam Houston Hotel, Curio, A Collection by Hilton (1924), Houston; The Redmont Hotel Birmingham, Curio, A Collection by Hilton (1925), Birmingham, AL; La Concha Hotel & Spa (1926), Key West, FL; The Fairfax at Embassy Row (1927), Washington, DC; Hotel Alex Johnson, Curio, A Collection by Hilton (1928), Rapid City, SD; The Graylyn Estate (1932), Winston-Salem, NC; Grand Naniloa Hotel Hilo, a Doubletree by Hilton (1939), Hilo, HI; The Admiral Hotel, Curio, A Collection by Hilton (1940), Mobile, AL; Punderson Manor State Park Lodge and Conference Center (1948), Newbury, OH; and The Whitehall (1963), Houston. Historic Hotels of America is the official program of the National Trust for Historic Preservation for recognizing and celebrating the finest historic hotels. To be nominated and selected for membership into the program, a hotel must be at least 50 years old; has been designated by the U.S. Secretary of the Interior as a National Historic Landmark or listed in or eligible for listing in the National Register of Historic Places; and recognized as having historic significance. Of the 22 historic hotels, 12 are also members of Historic Hotels Worldwide. Historic Hotels Worldwide promotes heritage and cultural travel by featuring a prestigious collection of historic treasures, including historic hotels, castles, chateaus, palaces, academies, haciendas, villas, monasteries and other historic lodging spanning 11 centuries.